Flock, what can be said but Holy Catfish!!! We laughed (see Facebook GIF party for proof), we cried, we shouted at our TVs, and we came out with an incredible 41 – 38 victory at the CLink over a Texans team that can put the biscuit in the basket! I grew up in Deer Park, NY (Long Island for many who likely don't know) … and across the street from my brother and I were this trio of big hearted brothers we had the privilege of calling best friends throughout the 80s, 90s, and into our adult lives. If the Sandlot were real life, and all sports not just sweet, sweet baseball, these guys were stars in our movie. Recently, the eldest of the brothers passed. He played and did all things with a bigness, and a smoothness, and an everlasting smile. He knew what you were going to do before you knew. He was the best kid on the court, or the field, or the rink and if he was on your team, you usually won, and you certainly were always better because of him. His name was John and he was #29. I mentioned some crying earlier right? When our #29 read the rook Watson like a fine piece of literature and took it back 78-yards to counter-punch against the early Texans haymaker… I stood up, raised a fist to the air and long after Walsh knotted the effort at 7, finally fell back to the couch, smiling, crying, remembering this Deer Park kid who always made it look easy, even though we all knew we could never do what he just did. KJ Wright is kinda a silent hero on this team. With the much bigger on-air personalities of Big Perm, Big Sherm, the aforementioned Earl, and the overshadowing in the box scores that B-Wagz would do to any teammate, KJ just does his thing and that thing is usually really, really good. On Sunday, us Flockers saw wayyyyyyy too much of #50 trying to chase their #10 around the yard. I don't pin this on KJ. Clearly this Texans offense does some interesting things to say the least, and 50 million Elvis fans can't be wrong, right? The City, States can and do put up points and they certainly create mis-matches throughout any given Sunday. What I'm wondering is if this Texans team, who had the bye week coming into this game, schemed up some brand new plays to earn these mis-matches OR if these were plays that were already on film, and they still burnt Richard time and time again? Anybody know??? We certainly saw less of KJ covering Hopkins in the 2nd half, thankfully, and you might be saying; “So what? Hopkins still killed us! ?” … and while stats don't lie, we did get this HUGE INT to Hopkins' side of the field at a crucial, crucial moment of the match! And FTR… Wright led the team in tackles, with 14 !!! There are MANY worthy INs. Sheesh looking down my list we're not even going to cover P-Rich or that amazing Coach Carroll fumble-forward challenge that kept a crucial early drive alive!!! We won't spotlight Frank the Tank going off and we won't even focus on Russ! That's how good #72 was in this game. Bennett wasn't everywhere, he was exactly where he needed to be, seemingly always. On multiple occasions throughout the sunny PNW afternoon, Bennett was 1 to 3 yards deep into the Texans backfield, blowing up a would be Lamar Miller effort. He tallied 2 huge sacks (1.5 in the record books) and he cause havoc on the line all day. Michael Bennett also saved this game for us. Awash in the headline stats was the most crucial tackle of the game. 2nd Down and 9, 1:56 left to go on the clock. A hole opens up along the right side of the Texans line and Lamar Miller bursts through for what looks like will be a game clinching rumble. Suddenly, Miller stumbles, and falls forward for a gain of 5, setting up 3rd and 4. If you re-watched the game or caught it live, Bennett gets a paw on Miller's foot and literally, saves the day. Yup, Bennett, in his 9th year, now has 5.5 sacks on the season. But on a day drenching with dynamite plays, this tackle gave our ‘Hawks the chance we needed! I don't get it… If you need to understand how I feel, see Tom Hanks' “Josh” in BIG. We're never trying to rip a guy personally, but I just don't get Tre Madden's value to this team. He's sparsely used and when he's in he doesn't block well at all. As mentioned on the FB Sea Hawkers Pod Ring of Honor during the game… Not a great look for a FB!!! Multiple times during the game he either got blown up in the backfield OR failed to sustain or even chip a guy out wide on certain stretch plays. I know, I know… Madden had a BIG catch and run netting us a Lemieux (in yards) setting up the game tying field goal in the 3rd quarter. 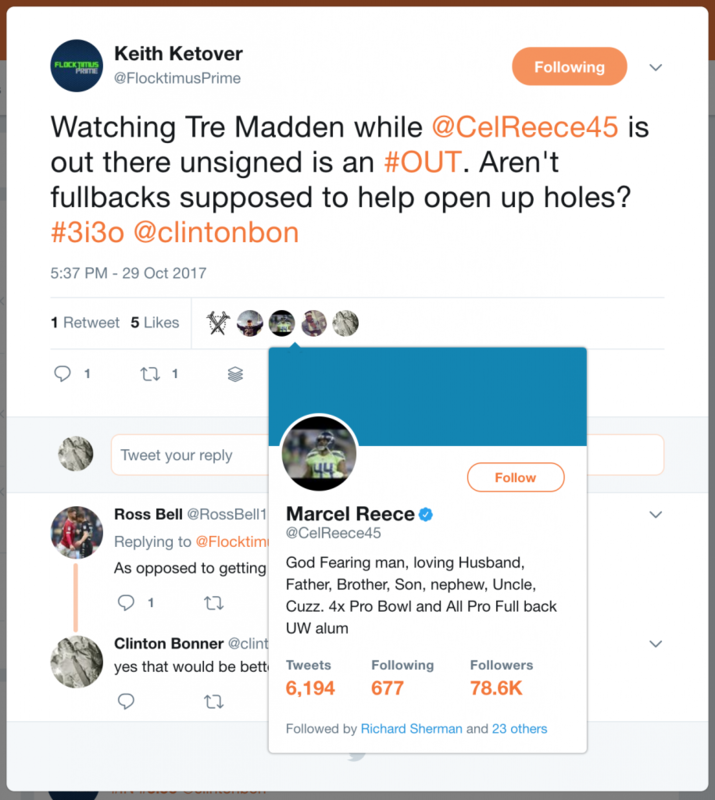 Tip the cap to Bevell for using a player no one was thinking of, at the exact right moment and hey, Tre executed it … can't take that away from him. But as far as Madden's value to this team… I just don't get it. Ever since training camp came to a pretty dramatic conclusion with the cutting of “Karen” Willams, most Seahawks fans have been questioning the decision to keep McEvoy on this team. Through 7 games, McEvoy didn't do all that many things to help his argument, dropping some easy passes and throwing a pick on a trick-play. On the ensuing KO, McEvoy put a hat on the ball, jarring it loose, nearly resulting in a turnover deep in Texan territory! It's role players like McEvoy that help you win championships… welcome back Mac! This OUT is less about a singular game or crucial play… but it's an OUT nonetheless. I do not think Tyler Lockett should return KOs for us any longer. He should still be our PR, he's really, really smart and most often makes the most out of every attempt he gets back there. On KOs… there's just a little something missing from Tyler's approach that was there previous to his terrible leg injury. He's almost too patient and during KOs, where you don't get too many opportunities a game to make an impact, you don't need patience, you need one-cut decisions and explosiveness. Let's not forget Tyler led the team in receptions (tied for 6) and yards (121) on Sunday, so let's not confuse the issue here. On KOs… this 12 believes we should try our hand with JD McKissic and measure the delta. Am I the only 12 not all that concerned that we gave up 38 points at home? Not to say we'd always make this ‘trade' but we had 5 sacks, 3 INTs and a pick 6 in this game. If we exchange TDs for FGs in the 3rd quarter, we win this game going away and even with that, our red zone O looked MUUUUUUUCH better. We're 5 – 2, we're home against a very banged-up Redskins team, and we just acquired a Pro-Bowl level Tackle… so, don't worry, be happy now! 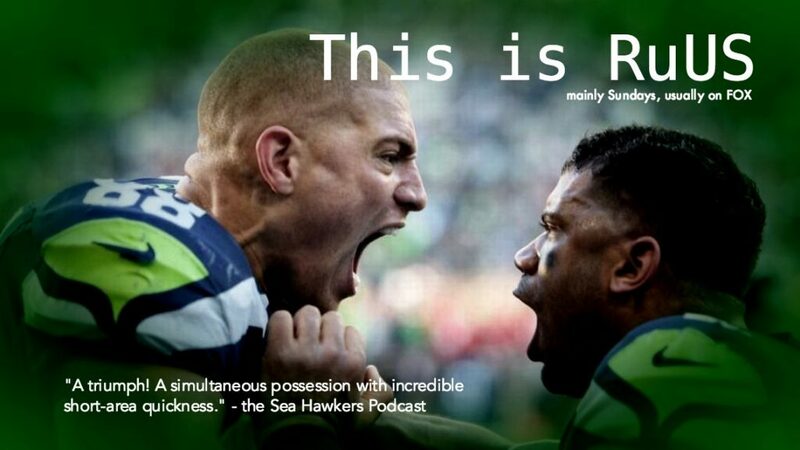 My favorite part of every Seahawks week is sharing this with all the Sea Hawkers Pod 12s who make this awesome. So, who got in the mix this week… a LOT of ya, so apologies in advance if I missed your #3i3o this week and enjoy the commentary below!!! Ross was none too pleased with Germain's early efforts… most likely sparked from false starts and another bonehead personal foul! DCH wrote it all in one succinct FB message 🙂 …well done DCH! Kevin saw the elusive ‘pocket thingy' … and so did I … thx Kev! This is RuUs 12s… This is RuUs. Until next week, Go ‘Hawks !! !